The Wall Street Journal reports that cross-border trade uses Chinese currency. SHANGHAI -- Three Shanghai companies used the yuan to settle cross-border trade deals for the first time Monday, a step toward promoting broader use of the Chinese currency internationally and, over time, reducing China's dependence on the dollar. Bank of China Ltd. settled a trading deal by a unit of Shanghai Electric Group, a manufacturer of mechanical and electrical equipment. Bank of Communications Ltd. settled trades by Shanghai Silk Group Co., a textiles exporter, and by a Shanghai-based trading house whose English name wasn't available. Chinese officials have said the yuan-based trade experiment is aimed at helping companies reduce the risks of exchange-rate fluctuations, which have led to significant losses at some exporters recently amid global financial-market turbulence. Officials also have in recent months voiced concerns about China's dependence on the dollar, which is used for most cross-border deals and which comprises the majority of China's roughly $2 trillion in foreign-exchange reserves. China's government has long tightly controlled its currency and its exchange rate. Beijing signaled its intention to allow the use of the yuan for cross-border settlement in December, but guidelines governing such transactions were only issued last week. 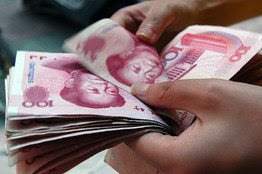 In its initial stage, the use of yuan for trade deals is limited to five Chinese cities, including Shanghai. "The trial will increase the liquidity of the yuan outside of China, but by keeping it limited to only a handful of cities in this starting stage, we can control the volume," Su Ning, vice governor of the People's Bank of China, said on the sidelines of an event marking the launch of yuan settlement. Mr. Su said that the program will help promote the stability of China's exports, and that a stable currency will help to expand the country's external trade. With dollar-denominated trade financing having dried up globally amid the financial crisis, yuan settlement will allow China's highly liquid banking sector to offer finance in yuan and help keep the country's export sector humming, analysts say. Separate to the three yuan-based trade transactions, Industrial & Commercial Bank of China Ltd. said Monday its Indonesian unit has provided a letter of credit for 372,000 yuan, or about $54,000, to a China-based exporter on an Indonesian firm. ICBC said it is the first letter of credit to be denominated in yuan for cross-border trade. My reaction: This is big news! 1) Three Shanghai companies used the yuan to settle cross-border trade deals for the first time Monday. 2) The yuan's use in trade settlement is a step toward promoting broader use of the Chinese currency internationally and reducing China's dependence on the dollar. 3) The yuan-based trade experiment is also aimed at helping companies reduce the risks of exchange-rate fluctuations, which have led to significant losses at some exporters recently amid global financial-market turbulence. 4) The trial will increase the liquidity of the yuan outside of China, promoting its use as a reserve currency. 6) Separate to the three yuan-based trade transactions, Industrial & Commercial Bank of China Ltd. said Monday its Indonesian unit has provided a letter of credit for 372,000 yuan, or about $54,000, to a China-based exporter on an Indonesian firm. ICBC said it is the first letter of credit to be denominated in yuan for cross-border trade. Conclusion: The move by China to settle trades in yuan spells doom for the US dollar. Take a look at "U.S. dollar unlikely to be toppled as top currency: economists", a view of the U.S. dollar's status from Canada's perspective. Unfortunately for Canada; the US dollar will fail and the Canadian govt and Canadian central bank putting their heads in the sand will probably cause Canada to be dragged down with it. What Canada should be doing right now is pulling out of NAFTA and building an oil pipeline from Alberta to the BC coast to export oil to asia.